Radboud University has asked Mark Bollen of Inbo to supervise the construction of the new Maria Montessori building. This is a unique opportunity nowadays. Having an architectural firm act as contract supervisor used to be very common; after all, the architect is usually the one who knows most about the project. In recent years, it had become a very rare occurrence, but the tide seems to be turning. An increasing number of clients realise that an architectural firm can contribute a lot of knowledge and quality in this phase of a project. Working in a BIM environment, managed by the designer firm, strengthens this trend. This is why we are very proud that we, as the total engineering team together with Deerns and Croes, can take on this role on behalf of Radboud University. As contract supervisor, Mark will have better supervision and grip on the project. He will keep a close eye on whether the ideas of the architects and client are implemented the way in which they were conceived, but he will also consider the interests of the client and the consortium. In addition, this position will allow Inbo to better anticipate for possible adjustments. We know from experience that in such projects, possible changes must be implemented quickly, but that it is also vital to properly think them through. The contractor and coordination agreement for the new construction project, with a total area of 26,000 m², was signed in July. In its design, Inbo has emphasised “a human scale” of the building. A building that would suit an institute that studies human behaviour from different perspectives and various sciences. Sustainable, pleasant, healthy and energy neutral. The building scores highly in various sustainability categories and has already received the BREEAM Excellent design certificate. The signing of the contract was duly celebrated. 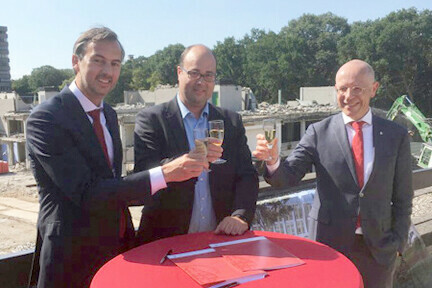 Together with construction company Berghege in a consortium with Heerkens van Bavel (for the structural part) and Croonwolter&dros (for the installation technological part), we will work as a team for the next few years. The structural part of the new building is to be completed in two years. Construction on the Maria Montessori building will officially start in November 2018.